The ‘Clowns’ Church’, the backdrop for a couple of key scenes in The Eighteenth of November, was a real church; the park surrounding it still exists. Having lived in London for ages, a great deal of it in Islington and Camden, I know the area well. So when I was looking for somewhere for Fabriel to find himself, after the fire, I remembered the little park on the Pentonville Road – an unlikely place to find a park. It is in fact the area around what was formerly St. James Church. 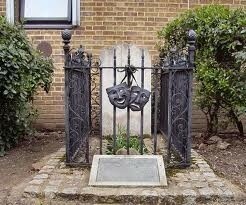 When I went to check it out I found this little grave, surrounded by painted railings, which bore at the front the twin masks of tragedy and comedy. At the back a ‘pitted curved gravestone’. 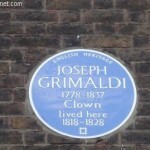 The inscription was faded, almost indecipherable in places, but enough to read the name Joseph Grimaldi. Here in this small park lay the bones of the most famous clown in the world. The man whose name lives on today in the generic name for a clown – a Joey. This sparked the idea of the ghostly clowns who appear later in the book. The original church suffered bomb damage and was deconsecrated and demolished. At the time I was writing an office building was being erected on the place where it had stood and which, misguidedly, was designed to resemble the church. It was a nice idea, but somehow it doesn’t work. There was a playground to one side, as mentioned in the book, but apart from that the place was a building site and ‘dark with overgrown bushes and overhanging trees’. was born in Islington, where he lived for much of his life. The park has recently been remodeled, smartened up and the grave renovated. Rather strange, musical, coffin shaped ‘installations’ are now set ‘on top of the grave’, which is a bit confusing as they are outside the small enclosed area I think of as the grave. I can only assume that they cover the actual plot where Grimaldi is buried, but how do they know? For many years St James was the venue for the annual Clowns’ Memorial Service. When the Church was demolished, the ceremony was moved to Holy Trinity, Dalston. Where it is still held. I will be posting an article about that separately. 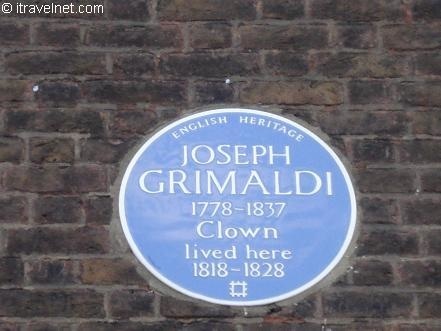 Directions: Joseph Grimaldi Park is sandwiched between Cummings Street and Rodney Street – about a third of the way up the Pentonville Road, if you are coming from King’s Cross/St Pancras, The postcode is N1. I can’t find a more precise one but if you look up either of the streets mentioned and find their postcodes, that will be enough to pinpoint the park.